The perfect clutch for aggressive drivers that still desire smooth engagement. Our Stage 3 clutches utilize a segmented Kevlar disc. This will provide more holding power than Stage 1 & 2, yet it still offers exceptionally smooth driveability and long life. Combined with our aluminum flywheel, this an excellent performance upgrade. Kit only includes cover assembly and disc. Picture is for representation only. To develop a clutch with all the desired performance characteristics for intended applications is the challenge of a high performance clutch company. 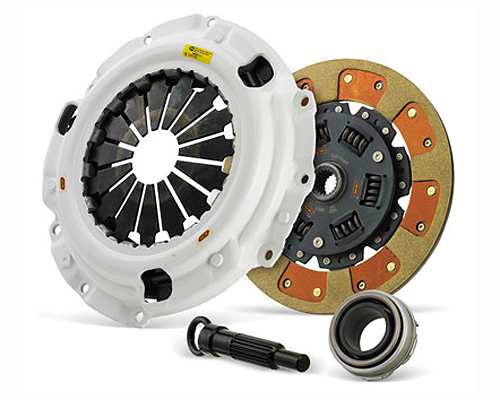 The Clutch Masters clutch system is unique in the industry. We use Hi-Leverage technology (refer to the Pressure Plate section) in our pressure plates, which significantly increases clamping force with no unnecessary increase in pedal pressure. Discs are designed either with reduced Marcel or a solid hub design to take advantage of our Hi-Leverage pressure plate. The combination of these cutting edge technologies creates the finest clutch system on the market. Additionally, Clutch Masters, with over 35 years in the industry, has researched hundreds of friction materials and uses only the best materials available for each intended application. By combining the optimum clamping force with the finest friction materials - each with their own unique coefficient of friction - Clutch Masters has developed a line of clutches that provide ultimate performance in virtually any severe environment.